Home / European Company (SE) / Latest developments / News on European Companies: Slowdown or new dynamics? 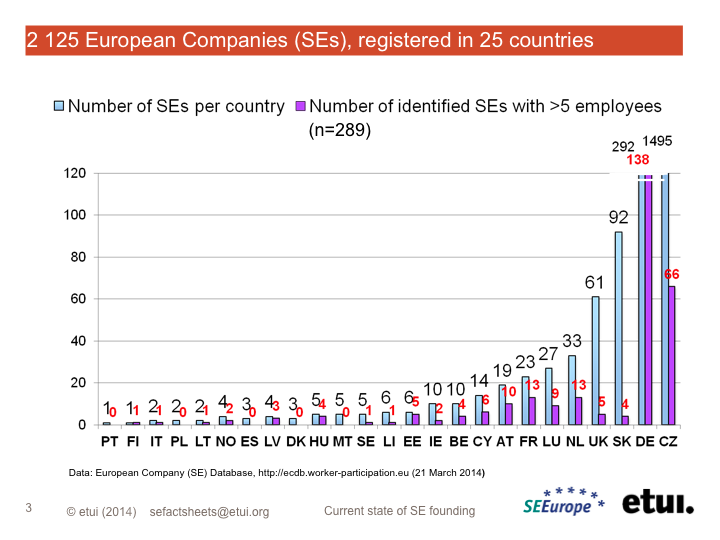 The April 2014 edition of the SE News provides the latest SE data available from the ETUI's European Company (SE) Database. As of 21 March, a total of 2,125 SEs were registered in 25 countries of the European Economic Area (EEA), an increase of 159 SEs in the past five months. The current dynamics may look contradictory: on one hand, the number of new SE registrations in the Czech Republic – the country with by far the highest number of SEs – slowed down significantly. On the other hand, there have never before been so many firms on our ‘planned SE’ list. Among others, such famous names as Airbus Group N.V. in the Netherlands and in France Christian Dior S.A., Schneider Electric SA and LVMH Moët Hennessy Louis Vuitton S.A. have announced their intention to transform into an SE. In Germany several companies with significant workforces have finished their organizational transformation, such as Axel Springer SE and KAESER KOMPRESSOREN SE. On the other hand, a handful of companies – among them some of the ‘oldest’ SEs – were transformed into a national company form (such as Deloitte SE) or went into liquidation. The Germany-based company Elster Group SE also made official its plan to transform back from an SE into a national form, GmbH. Several transfer of seat were also accomplished in the past few months, one of the largest companies being The Acon Group SE (active in the financial service industry), which moved from the Netherlands to Germany. As regards employee information, consultation and participation rights, unfortunately not too much improvement can be reported. Very few companies compared with the total number of established SEs follow the rules on involving their employees in the negotiation process required by the SE Directive (2001/86/EC). Since October 2013, however, at least four new SEs have been registered which complied with the rules: Allianz Global Corporate & Specialty SE, Axel Springer SE, Inros-Lackner SE and Kaeser Kompressoren SE (all headquartered in Germany). A total of 2,125 SEs were registered in 25 countries of the European Economic Area (EEA), an increase of 159 SEs in the past five months (1,966 SEs – October 2013). During this period, at least seven companies with more than five employees – five in Germany, one in France and one in Ireland – have finished their conversion process. At present, 289 SEshave been identified by the ECDB as ‘normal’ (269 SEs - October 2013). To our knowledge, only Bulgaria, Croatia, Greece, Iceland, Romania and Slovenia still host no SEs (no change since October 2013). 8 SEs moved their registered office from one EEA country to another. In addition to the already registered SEs, the ECDB currently provides information on 16 planned SEs. A set of slides providing up-to-date facts and figures on the SE. Click on pictures to enlarge.